SAF-T Auto Centers in Waterbury, CT offers expert brake service and repair. Your vehicle’s braking system is the most important safety component within your vehicle. To be safe on the road, drivers must ensure that their brakes are allowing total control of stopping and slowing down. Good enough is never something that you should accept for your brakes. SAF-T Auto Centers has a team that ensures its customers are always driving on the best quality braking system. Drivers are usually a tremendous help in making this possible. By paying attention to the condition of your brakes, you will know when to bring your vehicle in for a brake inspection. Any abnormal signs that you recognize from your brake performance should be followed by questions. Our team has the answers and the solutions to them all. We pride ourselves on taking the time to share all insights and information with our customers. Proactive customers usually get the quickest and the most affordable service. The sooner you let us have a look at your braking system, the sooner we can have you safely back on the road. Call (203) 755-7238 or stop by our Waterbury location at 40 Industry Lane. Your braking system will give early alerts and warning signals if you need brake service. These alerts can be audible or felt in the vibration of the steering wheel or brake pedal. The most common warning sign of a brake service need is the high-pitched squeal when the brake pads have worn down too low. If this goes unnoticed if can lead to a metal on metal contact which will cause a loud grinding noise. This means your brake pads have completely worn away and you are in danger of damaging your rotors. Damaged rotors are an expensive and avoidable repair. Lastly, if your brakes feel spongy or unresponsive you may have air or a leak in your brake line, low brake fluid can also attribute to this. Some drivers keep their stereos turned up loud, or may be running the air conditioner with the windows rolled up; doing this will not allow you to hear the warning signals. Brake noise can sometimes be hard to identify from inside the car, but other drivers and pedestrians will definitely notice. It’s a good idea to drive with your windows rolled down occasionally with the air and radio off, because this will allow you to hear any strange or odd noises. If you are experiencing any of the above problems bring your vehicle to SAF-T Auto Centers for professional and trustworthy brake service. Avoid costly repairs and potential problems with routine brake repair and maintenance. The noise may not be an emergency, but it certainly should not be ignored. Avoiding warning signals and putting off repairs for too long will ultimately lead to failure or worse, an accident. It also causes expensive and extensive repairs that are completely avoidable. A good rule to follow is to have your brakes inspected every other oil change. As always, our specialists are here to answer any questions you may have. Your Safety is our number one priority. We use state of the art equipment and quality parts to ensure that every auto repair is done correctly and with parts that meet or exceed safety standards. Whether you’re at the initial stages of brake pad wear, or at the point of needing to replace your rotors, you’ll be safely back on the road in no time. Our brake repair services can usually be performed same day, so don’t delay. 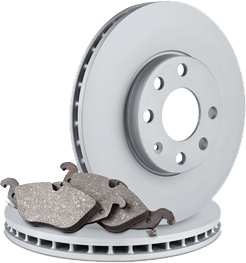 Our team of brake repair specialists will take care of any of your braking system needs. All you have to do is let us know what seems to be the problem. After a complete brake inspection, we’ll let you know exactly what is wrong and how we can fix it. Half the battle is finding the correct diagnosis. Come to us and get your brake service done right the first time. Call or schedule service online today.